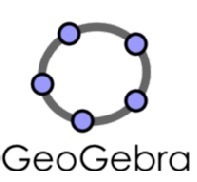 GeoGebra is dynamic mathematics software for all levels of education that joins arithmetic, geometry, algebra and calculus. It offers multiple representations of objects in its graphics, algebra, and spreadsheet views that are all dynamically linked.nnWhile other interactive software (e.g. Cabri Geometry, Geometer’s Sketchpad) focus on dynamic manipulations of geometrical objects, the idea behind GeoGebra is to connect geometric, algebraic, and numeric representations in an interactive way. You can do constructions with points, vectors, lines, conic sections as well as functions and change them dynamically afterwards. Furthermore, GeoGebra allows you to directly enter and manipulate equations and coordinates. Thus you can easily plot functions, work with sliders to investigate parameters, find symbolic derivatives, and use powerful commands like Root or Sequence.